ECTmmo.com- MMO Blog: The Adventures of Kaozz...: Hideouts Are Here! Today the Champions Hideouts are here! Yesterday I was a bit put off because I really wanted to check them out and pick mine our, but the wait was worth it and I was very happy to see they were implemented today. It was very tough to choose from them all. There are four which gold members can choose from, upon logging in you gain a free token to pick one out (click hideout button or type /hideout). There are more plans for adding additional hideouts soon, oh the choices! 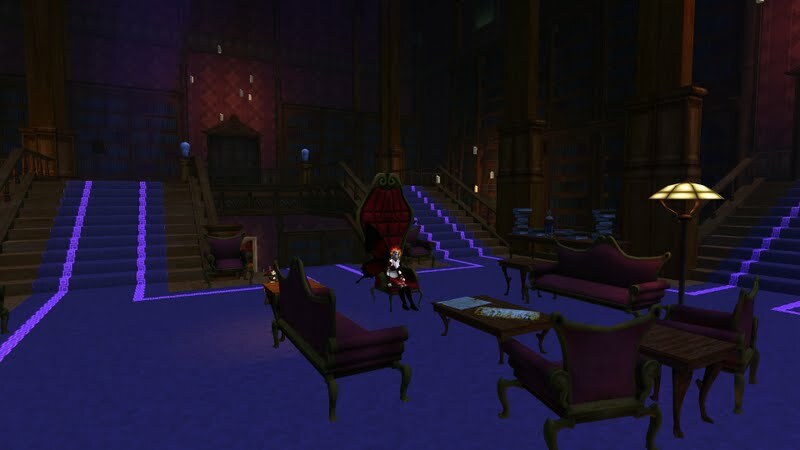 I went with the Sanctum because it was very classy looking. I also liked that it had a skylight where you can look up and see the moon, very mystical looking place with floating books all over, I'm happy with my choice! The rooms are already furnished but you can customize them a tad, carpet color and so on. Plus, there is an emote to sit in a chair (my EQ2 character is so envious) which is very cool for lounging around the hideout! Additional hideouts can be bought in the cash shop, you can have multiple hideouts if you like. Aftershock 6, the final issue, is out today. I am excited about finishing this series up. It sounds like it has a very cool ending and it should be fun to work on. I hear there is a really nice reward, I won't give any spoilers. If you want thoughts and spoilers check here.